Redefining unit measurements; 3D metrology; IEDM preview. 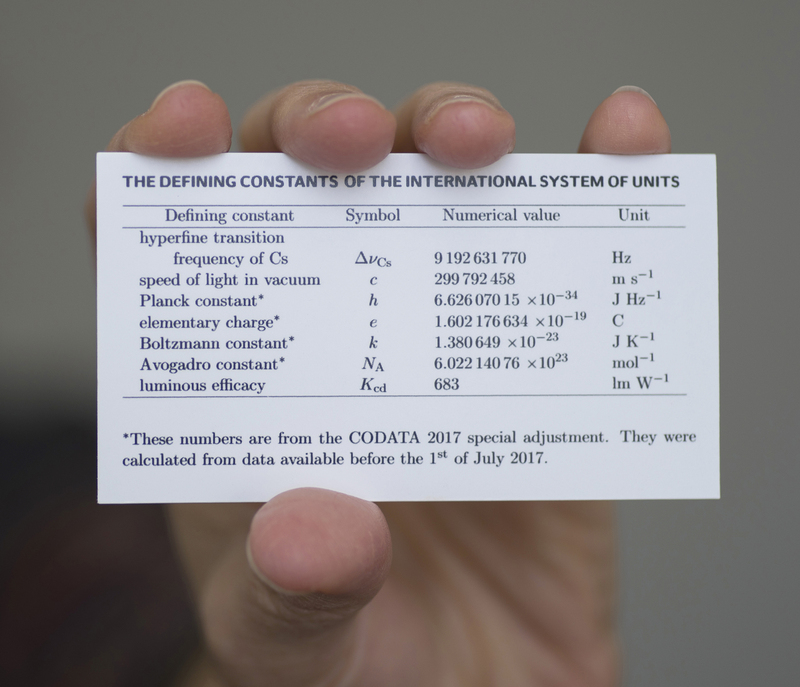 At a recent meeting, the International Committee for Weights and Measures (CIPM) took the next step towards the expected redefinition of four base units within the International System of Units (SI). The SI base units include the following metrics or constants–meter, kilogram, second, ampere, kelvin, mole, and the candela. For some time, the CIPM has been looking to revise four of those SI units–kilogram (the unit of mass); kelvin (the unit of temperature); ampere (the unit of electrical current); and the mole (the amount of substance). The way to measure these units are outdated. Since 1889, for example, the kilogram has been defined based on a platinum-iridium cylinder stored in France, according to the National Institute of Standards and Technology (NIST). The outdated method called for researchers to travel to France and compare their kilogram measurements to the cylinder. Going forward, the industry hopes to apply Planck’s constant as a means to define the kilogram. Then, temperature has been defined in terms of the “triple point.” This involves a glass cell of water. The measurement involves how water, ice and vapor exist in equilibrium. Going forward, the industry will rely on the Boltzmann constant for temperature. This relates temperature to energy, according to NIST. The volt and mole will change as well. The official rollout of the revised SI is slated for May 20, 2019, on World Metrology Day. Metrology, the science of measurements, is used to characterize tiny films and structures. It helps to boost yields and prevent defects in the fab, which in turn impacts the overall cost for chipmakers. At advanced nodes, though, metrology is becoming more complex, challenging and expensive. And there are a growing number of gaps in metrology, especially for finFETs at 10nm and beyond. Existing metrology tools are more than capable of measuring structures in two dimensions. With 3D NAND, finFETs and related structures, though, there is a metrology gap. There is a need to see structures in three dimensions at the atomic level, where the measurements are well below an angstrom. (One angstrom equals 0.1nm.) Today, chipmakers use metrology tools that provide some measurements in three dimensions. There are simply not enough of them. Here’s one possible solution: using scanning tunneling microscopy (STM), Osaka University and the Nara Institute of Science and Technology have created three-dimensional images of flat side-surfaces of silicon crystals at the atomic level. For years, STM has been widely used in the measurement and characterization of tiny structures and films. The challenge is to image the atomic structures of the side-surfaces in devices like finFETs, gate-all-around FETs and others. Osaka and the Nara Institute of Science and Technology have found a way to take the STM and image the side-surface of a silicon crystal. With the STM, the sharp tip of the instrument is placed close to the sample. The STM not only monitors the current, but it also determines the location of the atoms in the sample. “Our study is a big first step toward the atomically resolved evaluation of transistors designed to have 3D shapes,” said Azusa Hattori, a researcher. At the upcoming IEEE International Electron Devices Meeting (IEDM), chipmakers, R&D organizations and universities will present a slew of papers. IEDM, to be held in San Francisco from Dec. 2-6, will include papers from Intel and GlobalFoundries. Intel will discuss its previously-announced 10nm finFET technology, while GlobalFoundries will provide more details about its 7nm finFET process. In a separate paper, GlobalFoundries will describe a ferroelectric finFET technology. In the technology, doped hafnium ferroelectric layers at 3-8nm thick were injected into a 14nm finFET, enabling a sub-60mV/decade operation for both n- and p-types. Also on the logic side, Imec and Applied Materials will describe the progress in the development of lateral gate-all-around FETs and nanosheet FETs. Imec and Applied have built functional ring oscillator test circuits based on silicon nanowire FETs, with devices that feature in-situ doped source/drain structures and dual-workfunction metal gates. Then, EPFL and others will report on a novel multi-sensing smart system that can collect sweat and measure its biomarker content in real-time. The technology, dubbed Lab on Skin, uses arrays of sensors to simultaneously detect pH, Na+ and K+ concentrations in sweat.